Arrr you looking for clever pirate birthday party ideas? 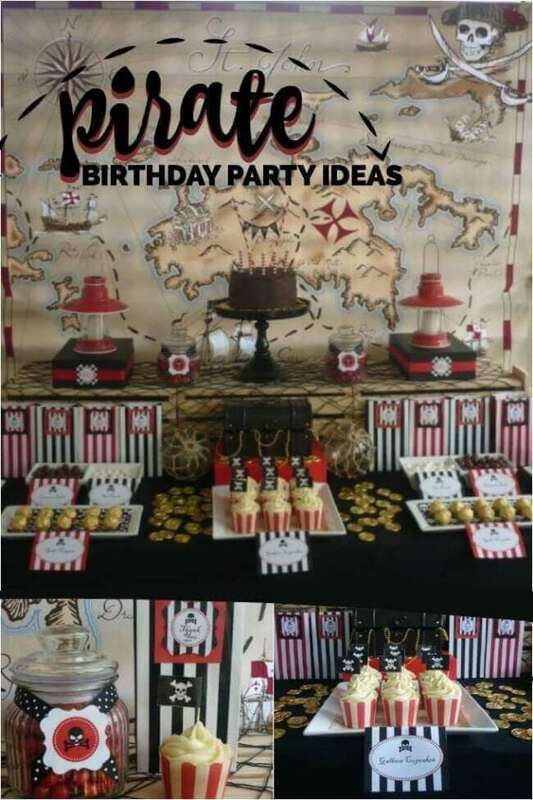 DIY mom, Valerie Pullam pulled together a seaworthy pirate party adventure for her son’s 3rd birthday. As the mother of 2 boys, Valerie is probably already quite proficient in using her imagination! Dreaming up scurvy décor and swashbucklin fun party favors appears easy for this talented mama. Catch a glimpse of how Valerie brought the pirate birthday party theme to life by creatively using her own printable collection, a stash of already-at-home decorations and fun party games to boot. Need inspiration for your next pirate party? Check out these fun Pirate Birthday Dessert Table Ideas. Perfect for little pirates, don’t miss these Adorable Pirate Themed Birthday Party ideas. Birthday parties can be expensive, but Valerie did what many great planners do: she started with props she already had at home; she borrowed other needed items from friends. It’s amazing what you can come up with by “shopping” in your own cupboards, drawers and closets. Valerie also designed her own printable décor, including the darling “welcome on board” signs. As you can see from the party table, “shopping at home” turned up some pretty great decorating treasure. Old baskets, golden chargers, seashells and gold coins were a-plenty and added an old world, pirate feel. Jewels, aka beaded necklaces, were arranged around the food table for a perfect accent. There were also a few store purchases which helped to finish off the look. A rustic looking burlap table runner, starfish garland and netting paired nicely with lanterns and glass bottles. The large “Beware of Pirates” signage and colorful pirate themed balloons helped tie the look and theme together. Personalization is always an appreciated touch at parties, so Valerie designed the “Happy Birthday Ryan” banner. Pirates have endless pits for stomachs, or so I’ve heard, but Valerie had a great menu planned to keep the hunger pangs at bay. Because this pirate party included both adults and children (due to the young ages of most of the kids), Valerie included a mix of food and beverage selections perfect for either crowd. Offerings included barbecued chicken and steak skewers and a large variety of salads. Snack food was plentiful with chips and dips, chocolate whoppers, goldfish, shark and dolphin gummies plus watermelon. Nobody wants a thirsty pirate. Adults sipped on Sangria, white wine, beer or water while kids chose between water and juice. I’m not sure who drank the “Bootleg Ale” but it’s a great touch! Valerie kept dessert offerings simple, but oh how delicious they look! Notice sprinkle cupcakes with printable pirate masts and flags; such darling detailing makes a big impact. A chocolate cake with vanilla icing was topped off with pirate themed candles. Activities and party games were planned with little pirates in mind. With a plethora of pirate props on hand, guests had fun running around outside, acting out their own pirate adventures. In addition, a kiddie pool was set up for cooling off; a sandbox was on hand for digging up buried treasure. Every successful pirate needs some treasure and these birthday pirates definitely didn’t leave the party empty handed. Valerie created loot bags worthy of the most discriminating pirate. Accented with printable labels and tags thanking birthday mates, the kraft paper favor bags were filled with chocolate coins, eye patches, pirate stickers and tattoos. I’d call that a great haul! Pirate Themed Birthday Party <– Adorable party food!